Halloween is drawing near so I thought I would look at pumpkin lanterns – and the swede lanterns I am more familiar with from my Welsh childhood. A swede? You may also know it as a Swedish turnip, yellow turnip or rutabaga. Here in the UK there is a long tradition of making lanterns from turnips, mangelwurzels and swedes for harvest time in general, but it was the Americans who started to call them Jack o’ lanterns in 1837 and to associate them with Halloween, in 1866. Thanks Wikipedia for telling me all that. American traditions have taken over in the UK now, not only by replacing root vegetables with jolly pumpkins, but also by creating this whole “trick or treat” thing. We hadn’t heard of “trick or treat” until the 1980s and I remember when children first started appearing in ghostly garb at the door I thought trick or treat meant they would perform a trick for the householder and the householder would give some sweeties in return. I didn’t realise they were making demands with menaces. I do have a vague recollection of one Halloween as a child when I was persuaded by friends to go out in the dark and throw eggs at a neighbour’s letterbox, but when my mother found out I got a telling off. I think it was known as “mischief night” but I find now that this can apparently relate to several different dates in the year, including November 4, the eve of Bonfire Night (Guy Fawkes Night). While pumpkins can be scooped out to make lanterns, there is no doubt about it that swedes need chiselling. I always used a sharp knife and cut out chunks, which is probably why the lantern usually had rather an angular face – just three triangular holes, if I am to be honest. But at least it was better than this ugly mummy-faced thing from Ireland. This is probably why there is such a different level of art possible with pumpkins. But what of the name Jack o’ lantern? As mentioned above, the root vegetable or pumpkin lamps weren’t given that name until 1837. But the legend goes back much further. It was probably Irish and there’s a good version on the Pumpkin Nook website. In brief, Jack was a mean and miserable drunk who played tricks on people. He trapped the devil up a tree and made him promise not to take his soul when he died. Then when he did die he wasn’t allowed into Heaven or Hell, so wandered the earth without a resting place, carrying his Jack o’ lantern. 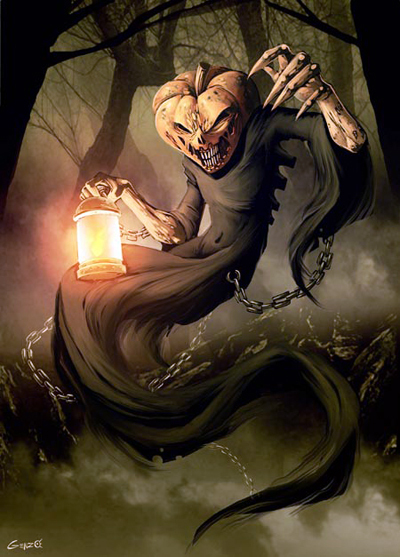 The name Jack o’ lantern also applies to the Will o’ the wisp or ignis fatuus (Latin for “foolish fire”) seen floating over swamps and marshes. I always thought wisp meant a wisp of mist, but according to Wikipedia it relates to a bunch of sticks or paper used as a torch. Superstition says a Will o’ the wisp will retreat if you approach it, almost leading you on (no doubt to a terrible fate). My parents simply used the term to mean someone elusive – “like a Will o’ the Wisp”.